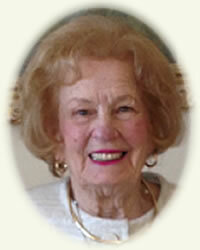 Obituary for Emily M. Pietak | Rhoney Funeral Home, Inc.
Emily (Amelia) M. Pietak, a retired office manager and former tour director, died Sunday at Mt. St. Mary's Hospital in Lewiston after a short illness. A lifelong Niagara Falls resident, she was the daughter of the late John and Juliana (Feledyn) Wozniak. She graduated from Niagara Falls High School at 16 and continued her education in Labor Management and Public Relations while beginning her administrative career at the former Moore Business Forms. She married the late Benjamin Pietak, a Prudential Agent and SBLI consultant, in 1950, and later worked as Office Manager of the Cataract Glass Company for twenty years. After retiring, she began a travel group at St. Raphael Parish (formerly St. Teresa), and for 18 years was their tour director, organizing trips to theaters and destinations throughout the US including Alaska and Hawaii. A gourmet cook, Mrs. Pietak enjoyed entertaining at home and at her cottage in Long Beach, Ontario. Known for her selfless nature, she was a longtime volunteer for the St. Vincent de Paul Society and the Niagara Falls Memorial Medical Center Women's Auxiliary. She was an active member of St. Raphael Parish and their Women's Guild, the Echo Society, and was a charter member of the organization now known as the International Association of Administrative Professionals. She enjoyed playing bridge with nearly the same group.of women for almost 50 years. She is survived by her daughter, Dr. Kathylynn Pietak (Dr. Eric Southard) and her son Dennis (Michelle) Pietak. She was the loving and cherished grandmother of Thomas and Caroline Southard, Juliana (Bradley) Klose, Rebecca (Kyle) Winner, Danielle (Brian) Hart, Maria Claire (James) Martin, Benjamin (Laura) and Michael Pietak, seven great-grandchildren, a sister in law Freda Wozniak and was the adoring aunt and Godmother to several nieces and nephews. She was predeceased by her brothers Walter (late Stella) and Benjamin Wozniak. Her family will be present on Friday from 4-8 PM at the RHONEY FUNERAL HOME, 901 Cayuga Street, LEWISTON, NY, where funeral services will be held on Saturday at 9:30 AM followed by a Mass of Christian Burial at 10:00 AM at St. Raphael Parish, 3840 Macklem Avenue, Niagara Falls, NY, with Rev. Ivan Skenderovic officiating. Memorials may be made in her name to the St. Vincent de Paul Society. Interment in Holy Trinity Cemetery, Lewiston, NY.